Only register adults in this area. All students must be listed in the STUDENT area to get the applicable student price. This is only for registering a Documented Original Tuskegee Airman. All other persons should register via the other categories available. Only register Students in this area. All adults must be listed in the ADULT area to get the applicable adult price. Additional seats at the table can be purchased through the normal registration process. You will be contacted by a committee person to gather Table name and Adult Guest. Thank You for supporting the ECCTAI Youth Programs and we look forward to seeing during this celebration of our youth. 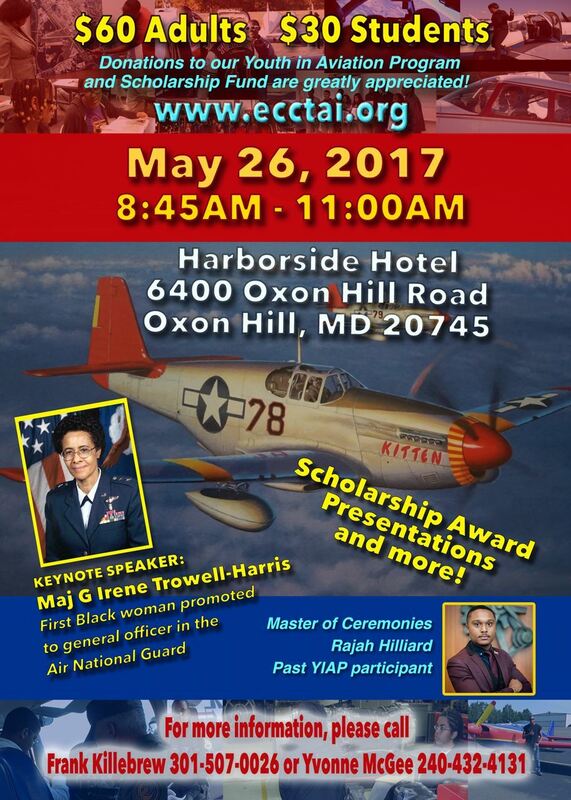 Please join the East Coast Chapter Tuskegee Airmen Inc. (ECCTAI) for a very special occasion: On May 26th we are Sponsoring a Youth Breakfast that will honor our alumni and current students in our Youth in Aviation Program (YIAP), we will congratulate the new ECCTAI Scholarship Winners and we will celebrate the 21st anniversary of ECCTAI’s Youth in Aviation Program.